Signature Hardware adds stainless steel range hoods to its exclusive Whittington Collection. Signature Hardware is expanding its extensive selection of kitchen appliances and hardware with its new line of premier stainless steel range hoods. Customers can create a gourmet kitchen experience with these state-of-the-art appliances. Made of high-quality, high-grade stainless steel, the range hoods are available in wall-mount, under-cabinet and island models to fit any kitchen setup. 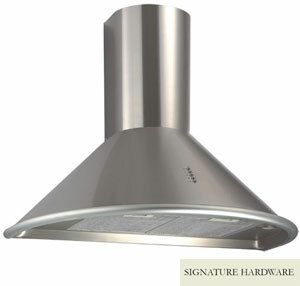 All wall-mount and island range hoods come with a telescoping flue to accommodate most ceilings. The exhaust systems eliminate moisture, smoke and grease with three-speed internal blowers that feature a 190-watt motor that delivers air flow up to 600 cubic feet per minute (CFM). These range hoods are quietly powerful, with noise levels that on their maximum setting stay below 66 db(A) noise level, maximum eight sones, which is comparable to a dishwasher or vacuum. Each range hood in the Whittington Collection includes integrated lighting to illuminate both sides of the stovetop, reusable, dishwasher-safe filters, and easy-to-reach push-button switches, some with an LCD electronic panel. These features make the range hoods a convenience no modern kitchen should be without. With prices starting at $350, the range hoods are an affordable way to upgrade a kitchen. Signature Hardware offers many styles of range hoods. Popular models include the Square Contemporary Stainless Steel Island Range Hood, Domed Wall Mount Stainless Steel Range Hood (shown) and the Sleek Glass Contemporary Wall Mount Stainless Steel Range Hood. Customers can complete the look of their cook's kitchen with Whittington Collection farmhouse sinks, kitchen sink faucets and cabinet hardware. These items and more can be seen online or in the company's free catalog. Customers are invited to order a free catalog online at http://www.signaturehardware.com/freecatalog or by calling customer service toll free at 1-866-855-2284.